New Delhi: Despite hue and cry amongst medical students of National Board of Examinations (NBE) making huge profits on the examination fee charged by it, the Union health ministry has refused any hand in the matter pointing out that it has no role whatsoever in the fee fixation process or its related decisions for the NEET PG entrance examinations. With NBE being an autonomous body under the Government of India, medical students had condemned the profits stating that ideally, NBE should have subsidized the fees. The NBE charges Rs 3,750 from each student (in General and OBC categories) for applying for the post-graduate medical courses’ test, while prominent institutes having national importance such as All India Insititute of Medical Sciences (AIIMS) charges only Rs 1,000 and Jawaharlal Institute of Postgraduate Medical Education and Research (JIPMER) charges Rs 1,600 for the application. 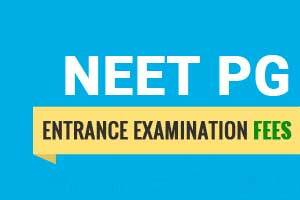 Given the above figures, for this year NEET PG examinations, NBE had received Rs 48.07 crore as application fee, of which it paid Rs 8.01 crore to the company (TCS) that conducted the computer-based test, as per an RTI reply from NBE on June 28. In comparison, AIIMS, which conducts tests twice a year, received Rs 5.04 crore for its AIIMS PG 2018 January session, of which it spent Rs 3.68 crore for conducting the exam, as per an RTI reply on April 4, 2018. In response to other expenses, NBE didn’t respond to several appeals and on June 14 said, “It is not possible to determine the expenditure,” adds News18. The daily adds that another RTI response from the Union Ministry of Health revealed that the ministry does not deal with the application fees as prescribed by National Board of Examination for NEET PG. This was indeed in stark contrast with the NBE statement on the issue. News18 reports that a medical student at MGIMS, Sevagram, one Khader Meeran, filed a series of RTIs to both AIIMS and NBE, following which he wrote to the Prime Minister Office (PMO). His grievance was accordingly forwarded by the PMO to NBE, which closed the case on July 31, stating, “Fee of NEET PG is approved by governing body of NBE and Ministry of Health and Family Welfare (MOHFW)”. While clarifying NBE’s stance to TOI, the examinations authority’s Executive Director Dr Rashmikant Dave, though, said the fees have been kept constant since its inception in 2013 at Rs 3,750 and Rs 2,750 for general and reserved category students, respectively. “There has been a marked increase in indirect expenses towards the conduct of examinations, including expenses of subject experts contributing to the question bank, validation of the question bank, setting of question papers, independent appraisers being appointed at each centre, increase in geographical coverage of the exam, payment to NBE employees etc,” stated Dr Dave. He added the NBE does not have any faculty member of its own and incurs heavy expenditure on remuneration and boarding. “NBE has significantly enhanced the security at the test centre by a compulsory deployment of jammers and hand-held metal detectors at each centre. NBE does not take any grant whatsoever from the government and is self-sustaining. Thus, the fee structure of NBE should not be compared with any other organization,” he added. How can the health ministry say that they are not involved in this.They have the guts power to say this with confidence because they know the answer will be very easily digested by none other than Indians. This is India. Health ministry must know all this. The council\’s are doing wat they want. The country has become medical MAFIA today. For entrance and for the final exams which one has to give many times the board is charging such huge amount after taking good fees during the course. Why? India rocks. So many families suffer but gets unnoticed.But still proud to be INDIAN. NBE charging Rs.5500 as examination fee for fmge which is too much.